There is an update of the official cgminer with Neoscrypt support to version 3.7.8 that adds new kernel with better performance and make the miner work with the latest AMD drivers 14.9, something that was not working with the older 3.7.7b miner. 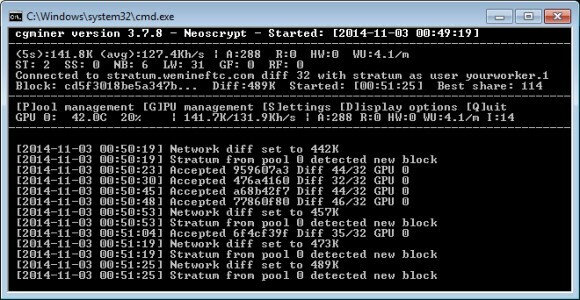 We have compiled a windows binary of the new cgminer 3.7.8 Neoscrypt (source) that you can download from the link below and try. Our first test on a AMD Radeon R9 280X without overclock has shown a performance of about 140 KHS, so about 50 percent increase from the older version and some people report going close to 200 with overclocked cards. Since there is still no CUDA miner for Neoscrypt available you can use this cgminer with OpenCL on Nvidia-based GPUs as well, though on Nvidia you are probably not going to see much of an improvement over the previous version of the miner.